I've completed one of the sleeve redo's for the Promise of Spring cardigan. There must be some gremlins in the house because I can't find the other one. I've got the rest of the sweater but I searched yesterday and can't find it anywhere. It's definitely in the house somewhere. Look likes I won't get to wear it any way as the weather here in SC has definitely turned springlike. 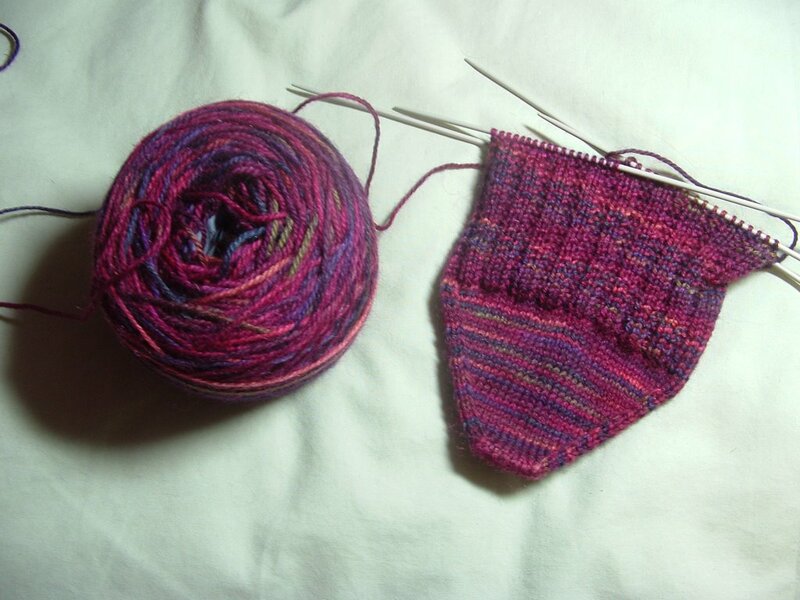 In the meantime, I've cast on another pair of socks. These are the Garter Ribs from Sensational Knitted Socks. I'm using Mountain Colors Wild Raspberry Bearfoot and size 1 Inox dpn's. My hands have been itching to make socks from this yarn since Oct '05 and I've finally bitten the bullet. I'm calling this pair Lilac Lace. They are mine own design. They yarn is Froelich Wolle Special Blauband. These are on hiatus while I make the Garter Ribs. My other set of size 1's are in the black Baby Cables. I've got other brands in size 1 but these are the socks I want to work on at the moment. I usually have one pair of socks in progess at a time, so this is highly unusual. Especially since they all have some type of patterning. What I'm doing is switching between socks and the sweater. A little rotational thing going on here. Your lace sock design is just beautiful. Will you consider sharing the pattern with us someday? I love both socks, especially your design. I'm working on socks now, too--nothing special, just plain old garter stitch. I'm using some Regia mostly cotton blend from Maureen's clearance bins. Beverly - I just found your blog, and I have to tell you that I am in awe of your knitting! I was tickled with the ribbons from the fair - nothing like award-winning work! I'll keep popping back in to see what else you're turning out.